When Sandra gained consciousness she found herself sitting in a cafe on the edges of Campo de’ Fiori. There was only one other tourist, a woman sitting on the other side of the square. That woman was likely to wait for a long time for a glass of wine or a pizza, since there was no staff anywhere to be seen. In the small alleys leading into the square the cars had disappeared. What would have delighted her previously — an old town of Europe unclogged by cars and Vespas — terrified her. Who was running the place? The sun had already set and there was a strange whirring sound in the sky. When Lucia gained consciousness she was sitting in a cafe on the edges of Campo de’ Fiori. She saw one other tourist sitting in a cafe across from the statue of Giordano Bruno. The lights were on in the surrounding apartments, but the lights had an incandescent orange glow, which pulsed ever so slightly. She heard whirring sounds above her. Looking closely, she could tell that the sounds came from three slim crimson objects that were moving in different directions across the dark blue sky. Lucia remembered the face, the friendly smile, the sense of adventure. She also remembered her softness and her vulnerability. The woman was so open that she might be the prey of anyone. Lucia felt protective, as if she should warn her about pick-pockets and Italian men. It was ironic: Lucia’s world had undergone some strange radical change. Her boyfriend was gone. There were no cars. Lines of crimson energy seeped from the glowing windows. The sky whirred with crimson objects that looked like miniature helicopters, crosses, or flying saucers. And yet she felt she should protect this woman. But from what? The two women sat there, not wanting to let go of each other’s hand. They said nothing for about five minutes. They looked around them at the empty square, and above them into the dark blue sky. Giordano Bruno looked down on them from above. Then from the corner of her eye Lucia saw a pink cube emerge from Via del Pellegrino. The cube crossed the far corner of the square and turned left on Via dei Baullari. The cube was about three metres high and seemed to float without noise above the square stones and uneven ground. The Baulian was going to a meeting of senior integration officers on Via dei Baullari. The Baulians were a proud species, and were oddly flattered that the Italians had named a street after the baullari or trunk-makers. The Baulians could see that the Italians took great pride in oblong and rectangular things such as luggage, purses, cars, and trunks. They were tickled pink that the street name sounded so much like their own name. In fact, in some transliterations, they referred to themselves as Baulari, rather than Baulians. 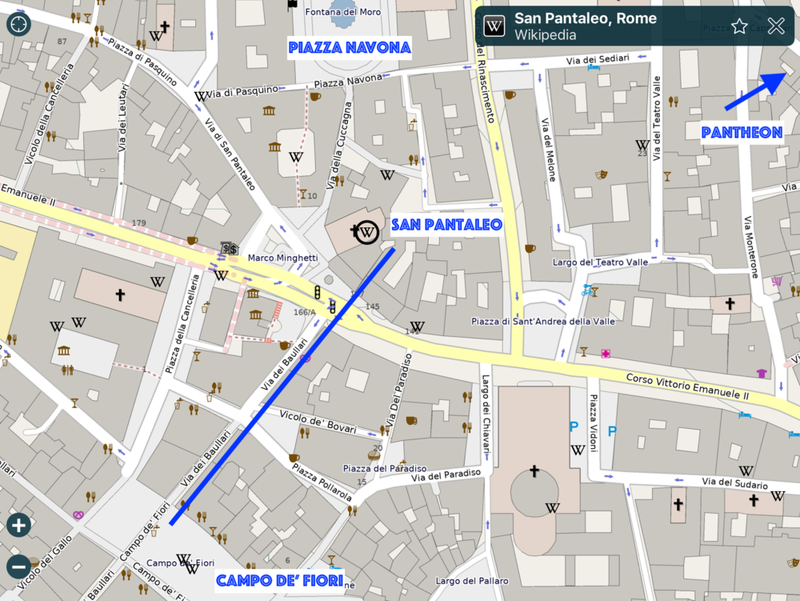 They therefore decided to make the scalene triangle between the Campo de’ Fiori, Piazza Navona, and the Pantheon the centre of their Italian administration. They vowed to keep Via dei Baullari exactly as it was, and made the Church of San Pantaleo, across the Corso from Via dei Baullari, the administrative capital of the Province of Southern Europe. The Baulians widened the doors of the church, added several floors beneath, and adjoined several nearby buildings, yet they were determined to keep everything else as original as possible. The Corso swept westward to the Vatican, with its diverse treasures of human history, and eastward to the Forum, the Coliseum, the Trajan Market, and the baths at Caracalla — an open air museum that brought to life one of the most powerful and influential empires Earth had ever known. At the centre of it all were the trunks and travelling roads, the Via Romana and the Pax Romana, the Senate and the Dionysian festivals, the gods and the resurrected God, the stylish cafes and the markets. Baulian tourists would be thrilled. Lucia assumed that the pink cube either didn’t see them or wasn’t interested in them. She didn’t consider the possibility that the Baulians couldn’t register their existence.